Have you ever sat through a friend or neighbour’s holiday snaps? Glass of wine in hand and eyes glazing over? The perfect holiday cottage, pure blue skies, clean beaches, unfettered views. Feeling more than a little wistful, you may wonder how you missed this fabulous location when you were planning your much-needed summer break. You might be surprised to find Brecon at the top of our list, but we can’t say that we are. Nip into ‘The Tack Room’ or ‘The Aga Room’ at award winning The Felin Fach Griffin pull up a chair next to a log fire and sample the local produce. We love the traditional names of the rooms at this inn, they give off an air of comfort before you’ve even sat down. And you’ll be torn between an array of locally sourced food – venison from the local Welsh Venison Centre or peas coaxed from the pod in the garden that morning. Decisions decisions. Now that your stomach is full how about a stomp around Brecon’s calling card – the Brecon Beacons National Park. Mix a little history with your hike and take on ‘The Gap’, an unmissable view and a natural break between the mountains, said to have originated in Roman times. Ahhhhh Cornwall, from Penzance to Port Isaac and all of the idylls in-between, Cornwall is beloved as much by its residents as by the hordes of Londoners that beat a retreat down the A303 each Friday night for some sun, sea and surf. But sunny beachside holidays aren’t all that Cornwall’s about…With the Falmouth Beer Festival on the horizon this October you can indulge in a spot of beer, or cider, swilling whilst your feet tap to the many live local bands that take to the stage. Or if you’re after a more sophisticated taste experience opt for a sloe gin at the Gin Festival in St Ives. Both of these Festivals happen this month, perfectly planned to keep the autumn blues at bay. Bottoms up! With over 2,000 properties to choose from in Cornwall, you’re already well aware of the delights of this county. But perhaps less aware of one of it’s hidden jewels? The Porthcothan coastline in north Cornwall is supposed to be one of the most beautiful in the world. A mighty claim indeed, but one upheld by our Trusted Travel Writer. With ‘seven bays for seven days’ that’ll keep you busy for the first week of your holiday at least. 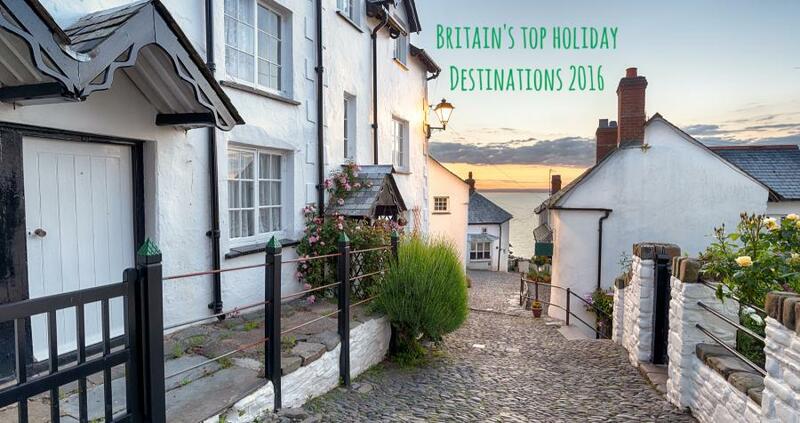 A thirst for wide open spaces and a dramatic coastline has put Gower firmly in third place. You’ve never been? Well now’s your chance if you’ve started the search for your 2017 cottage holiday. At the western end of the Gower Peninsula is Sam’s Surf Shack where you can feed your thirst for adrenaline by hiring a board and taking to the waves. If you dare. Afterwards we recommend popping into The Bay Bistro & Coffee House where you can pass the time in a much quieter, and dare we say it, more civilised fashion with a cuppa and a slice of homemade cake whilst drinking up the view over Rhossili Bay. As the UK’s first AONB you’ll not be short of opportunities to explore the outdoors. And it’s fair to say that many of those that holiday in Gower are rather partial to donning stout walking boots, grabbing the obligatory walking stick and heading out for a hike. There’s much to recommend of course, the Bishopston Valley walk reminds us that the Gower isn’t all about the coastline. Explore ancient woodland, underground rivers and limestone caves. Sounds magical doesn’t it? It can’t be pure coincidence that one of our top holiday destinations of 2016 is also the region purporting to have the most celebrity chefs in residence. Yes, you’ll be spoilt for choice on the food front if you choose Dorset. With such a good reputation for local produce it’s no wonder that the region has attracted some of the culinary world’s brightest stars. The Jetty in Mudeford is one such restaurant that’s well worth a visit, we’ve heard that the fillet of hake, fresh from the Dorset coastline, is sublime. And speaking of coastlines did you know that celebrated children’s author Enid Blyton was so taken with the area back in 1931 that the landmarks appeared in her books? Corfe bears a remarkable likeness to Kirrin Castle, with Whispering Island based on Brownsea Island too. High praise indeed. If you happen to be holidaying with kids in tow there’s an absolute wealth of days out. Pack your wipes and your antibacterial gel and head off to Abbotsbury Children’s Farm or Farmer Palmer’s. Both have hands-on animal events galore. And both require a G&T post-visit. For a less hectic and altogether more traditional day out in Dorset, you could always just grab buckets and spades and head to the beach at Weymouth. The thing about Yorkshire is it’s all of your holiday requirements rolled into one. Seaside? Head to the Yorkshire Coast. Looking for more rural? Try the North York Moors or The Dales. Fancy something cosmopolitan with a bit more to do? York or Whitby are certainly worth exploring. We put pen to paper recently when we discovered that Yorkshire has it’s very own day celebrating everything, well, York-ish. Our 35 stereotype-quelling Yorkshire facts will leave you in no doubt as to why it’s earned its place in this round-up, and why those that holiday in Yorkshire are a loyal bunch. If you’re short on time however this whistlestop tour of Yorkshire should suffice. The Abbey at Whitby is unmissable for those interested in history. Built in the 7th century it looms over the town, with St Mary’s Church sitting just next door, famous in it’s own right as being the setting for Bram Stoker’s Dracula. If climbing 199 steps up to the Abbey didn’t prove exhausting, head over to the Dales with its rugged and dramatic peaks and crags. Now here’s a talking point, just how did the Yorkshire rocks turn Agatha Christie’s handbag to stone? Must be something in the water…Looking for the heart of the moors? We think you’ll fall in love with Danby. A proper moors village and the location for The Moors National Park Centre. Danby Castle is also nearby and was a former home to Catherine Parr, the sixth wife of Henry VIII. And the one that survived. Having holidayed in Devon over the years we can attest to it’s many attractions. As probably can you, if the number of enquiries our Devon agencies receive is anything to go by. If however, you’re a Devonshire newbie, take a look at our cottages in Kingsbridge. It’s a really lovely little town sporting a pretty harbour and traditional town centre. From there it’s easy to pop over to Salcombe and head down to the Winking Prawn for a prawn baguette (what else) or Devon cream tea. All to be consumed whilst the ankle-biters avail themselves of the plentiful array of dressing-up clothes and the odd colouring book or two. For beach days the wide open sands at Bigbury on Sea provide all that you need in the way of a spectacular view of Burgh Island and some welcome amenities to make your day just that bit more comfortable (we count toilets and a steaming hot cup of tea as essentials). The sea tractor will also provide amusement at high tide. And on the journey home stopping at Aune Valley Farm Shop will be just what’s needed to stock up on supplies for dinner at your holiday cottage. Selling locally produced meat, cheese, pies and pasties, throw in a few olives and a bottle of wine and you’ll be all set.